The very words “A Gainsborough Picture” produce in this writer a nostalgic glow, inextricably linked as they are with the Will Hay films he saw in his youth. The opening music combined with a refined lady nodding delicately to the camera (and to me, it seemed)- set up expectations which were always fulfilled, expectations of a warm, cosy Britishness- usually connected with a light-hearted storyline full of pleasant eccentricities and character actors. The Clairvoyant, however, sweeps such cosy notions aside in favour of a strikingly stark opening. A dramatic drum-roll accompanies a close-up of a man as the light fades and he is plunged into silhouette. Then- the title of the film appears, and we see that the man was no other than Claude Rains, appearing in a low budget British film directed by the prolific (but still relatively unknown) Maurice Elvey. Fay Wray’s name also appears in the credits- yet another intriguing contribution to what is an excellent little film. To outline the plot of The Clairvoyant- Maximus (“King of the Mind Readers”)’ put on “gift” actually comes true- is to denigrate a beautifully made and finely acted film which is an intensely atmospheric ride, at times almost Hitchcockian in its tension and red herrings. This is perhaps not all that surprising, for the film brings together an array of talent who worked with that great director. The wonderful soft-focus cinematography for The Clairvoyant is by Glen MacWilliams (who also shot Hitchcock’s under-rated classic Lifeboat just over five years later). This not only maintains a strong emotion throughout- particularly in those scenes set at night- but establishes a highly aesthetic quality to what could have been a run-of-the-mill thriller. The costumes (by Marianne), the music (by Louis Levy) and the writer who adapted the film (Charles Bennett) also link to Hitchcock- for all were involved in The 39 Steps made in the same year as The Clairvoyant. The Hitchcock connection is not restricted to crew, however. Donald Calthrop (who played Tracy in Blackmail (1929) also appears, playing a similarly seedy role, albeit in a less threatening way than he does in the Hitchcock film. For all its age, The Clairvoyant does maintain the interest- and the plot twists continue to astonish, as do the sometimes ambitious set pieces. In a way, Maximus’ story could be seen as a satire on the cult of celebrity- especially in the way it develops after the Humber prediction, as, even now, the public at large are happy to have someone to blame, someone to vilify. Thus, the focus of the film becomes a timeless one, the only slightly uneasy note coming at the very end of the film, though it is hard to posit what would have made a more satisfactory ending given what had gone before. For a generation used to the vulgarities of thrillers that must (by necessity) have pounding music and often incoherent dialogue, The Clairvoyant might look (and feel) like a museum piece. But, if you look beyond the sometimes grainy images you will be amply rewarded. “A Gainsborough Picture” meant something special in my formative years, and still does now- in part thanks to films like The Clairvoyant, which, like Maximus’ prophecies, deliver what they promise. 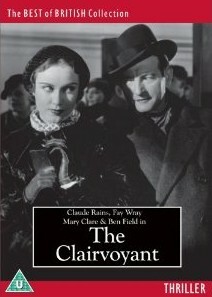 'The Clairvoyant' is available on DVD from Odeon Entertainment.